I’m a big fan of Billy Coffee! He has a fantastic sense with words that states the most profound truths in both an obvious and poetic way. I usually don’t underline quotes out of a fiction book, but I do with a Billy Coffee book because of his profound skill as a writer. 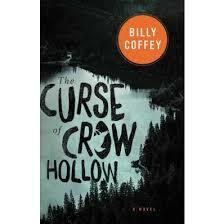 I was really impressed with THE CURSE OF CROW HOLLOW. To be honest it was a slow start for me, but once I got into the book, I couldn’t put it down. Billy has a way of making the characters become so familiar and real; each one manifesting a reality that he wants to address in his fiction. As the narrative was unfolding I kept guessing at the mysteries wondering, is this natural or supernatural. Billy does a great job at holding the tension between the two until the big reveal at the end. The reveal at the end of this story was quite good and paradigm shifting (much like watching the movie the 6th sense for the first time). It makes you want to go back and read it all over again. I highly recommend this book to anyone interested in great southern fiction. The questions at the end are also great discussion questions for a book club, etc.